I'm honored to serve as Lead Designer of Tesla after Jules, and I wish him well in his new position! I hope to continue Jules' work on Tesla with the same passion and dedication. Lately, Tesla has been exploring two themes: anticipation and progress. As we have designed cards to capture these two themes, it's become clear that there are many forms the future takes: different kinds of anticipation and progress, each a different experience... and it has been noted that perhaps Tesla would be best if it focused on a few kinds, rather than using them all. The big questions, then, are these two: what kinds of anticipation and progress are there? And which kinds do we want to focus on in Tesla? Let's start by looking at anticipation. I'll be using examples from previous posts to illustrate the two major variables that go into anticipation in gameplay. The first major variable in anticipation is whether you're anticipating the certain or anticipating the uncertain. There's a big emotional divide between waiting and hoping! Anticipating a certain outcome, like Groundbreaking Discovery does, allows players to more reliably use the fun mechanics, and minimizes luck-based losses. On the other hand, uncertain outcomes can lead to more emotional investment and excitement. Improvised Weaponmaster both has you gamble on the top card of your library, and on your opponent not having any tricks. This form of uncertainty is great for fostering an exciting and interactive game, but it also means our players will less reliably be able to use their awesome effects. What do you guys think - should we go with awesomeness with certainty, or excitement and interaction with uncertainty? The second major variable in anticipation is whether you're anticipating a one-time event or anticipating a repeating event. Looking at the examples, Ascendancy promises a one-time explosion of spells coming back from the graveyard, while energize instead gives you a more consistent anticipation, an event that can reoccur. Anticipating a repeatable event comes with a lot less gravitas and significance, but it's also more likely the players will experience the fun of it triggering. A one-time event has more emotional punch and room for stronger effects, but it also is less certain to ever trigger. This trade-off is very similar to certainty versus uncertainty, and this can be used to our advantage! Notice that, in both these examples and the previous ones, we've had certain one-time events and uncertain repeating events. These pairings compensate for each other's trade-offs. On the other hand, if we want to either maximize emotional tension or reliable fun, we can do uncertain one-time events or certain repeating events, respectively. An uncertain one-time event is one where you're uncertain when, or even if, you'll reach the culmination - for example, Student of Elements isn't guaranteed to get flying at a specific time, and might never get it at all. On the other hand, certain repeating events are things like Verdant Force. What do you guys think? Personally, I'm a big fan of anticipating one-time events. Since it feels so much like 'building towards an ultimate goal', I think it might be our best fit for Tesla. However, I'm not certain whether we want to go with certain or uncertain one-time events. What do you guys think - should we go with one-time events, and if so, should they be certain or uncertain? Next, we look to progress. Progress is interesting in that there are three major variants, and they're all differentiated by one thing: the journey between start and finish. The fact the journey finishes is important, as progress is about working toward a destination, which means all forms of progress inevitably involve one-time anticipation. However, the different variations of progress can also include repeating anticipation as well. Again, let's illustrate these variants with some mechanics from Tesla's skilled designers. In one variation, Progress is binary - you go from 'start' to 'finish' with no journey between. for example, in video games, this form of progress is often represented by power-ups. The 'start' is not having the power-up, and the finish is having it. In this way, there's no measurement of the 'journey' - you're either there, or you're not. Charger is a great example - one attack is all you need to charge the card completely. As binary progress has no measurable distance between the start and finish, the only anticipation it has is the one-time anticipation of untapping and charging it. In another variation, Progress is all about completion. Just like in the last variation, you get nothing until you reach the destination of your journey - but this time, the journey has measurable distance between start and finish. A good real-world example is a download: you can always see how far along your download is, and until it's complete, the downloaded file can't be used. Industrial Revolution is a great example of completion progress in Magic: you can clearly see how close you are to tapping 10 permanents at any time, but until you've done so, cards with Industrial Revolution remain without improvement. Lastly, there is growing Progress. Like the last variation, you have a way to measure your completion of the journey - but unlike the previous two variations, you don't have to wait until you're completely done with your journey to reap the rewards! Jules noted two excellent examples of growing progress in Magic - Ghoultree and Death's Shadow "which progress in a measurable way but have a maximum potential that can result in the same feelings of 'getting all the way there'". We can also see this same form of progress in the mechanic Battle-Charged: You get a +1/+1 counter each step of the way, but you do 'max out' at some point. Both completing progress and growing progress give you repeating anticipation with each step of the journey, but reaching the finish can be either repeating or one-time anticipation, as noted earlier. In the case of Industrial Revolution and Battle-Charged, they build up towards a finale, so it also includes one-time anticipation. Being able to mix the two forms of anticipation like this might be valuable to capturing a wide breadth of experiences and emotions in Tesla. Personally, I think growing progress is the way to go, because it gives you positive feedback every step of the way, and captures both forms of anticipation in a simple and intuitive way. What do you all think? Whew! That's a lot of stuff, but I think it was vital to establish all of this for the discussion ahead. Being able to refer to our designs and mechanics with goals and experiences in mind will help. especially as we begin to work towards capturing a more specific experience with Tesla. Welcome to the team! We're all extremely excited to have you on board, and vindicated to see that you've taken off running with important next steps for Tesla. It's an honor to hear such kind words, Jules. Great to see you leading the design for Tesla, I think you have the best sense of holistic vision of anyone I have met here at GA! Thank you, Tommy! That's quite the compliment! 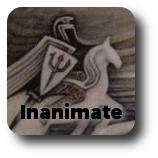 Even before we knew there would be a need to replace Jules on this project, Inanimate's enthusiastic well-considered posts had caught our attention. We look forward to seeing where he takes Tesla, and his first post seems like a good omen. Uncertain one-time events sound like they'll be disappointing. The only exception I imagine is if each failure leads to something greater as you try again. Waiting feels a bit more like Engineering to me where hoping feels more like Science; In Engineering, we know what's possible and just need time to figure out how to work it; In Science, we have a hypothesis and try a number of experiments hoping to find evidence for or against it. Growing is a fine form of progress, but one most every set has to some extent. Binary progress feels too simple …but simple is a good thing when you're designing commons. Completing feels like it's going to be our bread and butter; invention and discovery are often long paths, with many ups and downs, lessons learned and mistakes made, but they are very much defined by the final result, and are considered failures when they have none. I agree that uncertain one-time events have a maximized chance for disappointment. Too much 'emotional tension' begins to become overwhelming, you know? Those are excellent analogies for Waiting and Hoping. Very nice, and you totally capture the experience-in-gameplay with them. Gonna have to keep those descriptions in my notes for future reference! You're right that we see growing progress more often than the other two forms of progress - but that's because it plays very well. We can tell a better story with completing, but is that story more fun to play? Magic, as a medium that wants to be fun and tell a story, often has to face the decision between what's better for gameplay, and what's better for the "experience". Your arguments on behalf of completion progress are excellent, and I now totally agree that completion is the better variant for capturing Tesla's experience and story. However, in pursuing completion progress we do lose on some positive feedback in the set, and open up a lot more potential for 'feel-bad' in the set. Luckily, though, I think if we have this in mind, we can design the set around it to minimize these problems. For example, we can make sure that there isn't too long of a journey between incomplete and complete. And we can make cards that protect, even reward, "work in progress" cards that aren't quite completed yet, but are on their way. Interesting questions. Thank you for the insight, Jay. 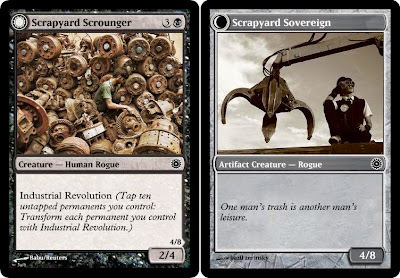 I see completion progress as the Devotion of this set: a high-profile mechanic that has the potential to tell exciting stories, but not one that is a defining presence of the draft format. I wouldn't like to play a draft format where the goal of every deck is to play its own solitaire resource-accumulation game and ignore the opponent entirely except insofar as it draws removal for its opponent's resource-accumulation engines. Are all "anticipating the certain" mechanics required to use time as a variable? What I'd like to see is a mechanic where random chance is not a factor in whether the anticipated result happens, but decisions involving hidden information can potentially affect it. Combat math is actually a fine example -- if I have a 3/3 and you have a 2/2 flier, then I know I'm going to win the race unless you do something. Likewise with develop, draw effects, shuffle effects, and scry (now evergreen!) can affect whether the anticipated event happens, but it's now up to the players to proactively try to modify the result rather than resorting to crossing their fingers and hoping for or against it. Suspend would be a good example if its implementation wasn't so clunky. My biggest gripe with Develop is that it's mixing known information into the middle of unknown information, which has the potential to create all sorts of logistical/dexterity headaches. "Anticipating the certain" does not have to use time as a variable, and I probably should have found an example mechanic that used a different form of certainty. On many Leveler cards, where the cost to Level Up is less than the card's initial mana cost, you're (in almost all cases) going to have the mana to level up the card each turn, and if it doesn't die, you'll be able to level it up to completion eventually. Since it doesn't have to interact with your opponent or do anything uncertain to level up, it's "anticipating the certain" - but unlike a normal time-based certainty, it can move at different rates, which can be very valuable. Combat math is indeed a great example of something that occupies an interesting space between certainty and uncertainty. But it's also a good idea because it includes interaction. Interaction allows us to avoid the 'solitaire resource accumulation game' problem, by forcing you to play nice with your opponent to improve your stuff. Your insight about combat math is great, and is really getting my mind whirling with ideas about this interplay between "certainty" and uncertainty, and how interaction between players is such a great representation of that. I think this warrants more exploration. @Jenesis concerning the logistical/dexterity issues of Develop. As someone who has been playtesting the mechanic in paper for the last 4 months with Dreamscape and Premonition I actually think the logistical issues are far more minor than they initially seem. Players quickly learn shortcuts with mechanics like like with rebound and putting a dice on top of your library. Likewise, without me prompting my playtesters started putting the face-up cards in the library either sideways or poking out from the top so that they were easily visible. The comprehension complexity is the main concern with lots of questions about how it works with card drawing, milling and shuffle effects. Morph had similar CC concerns so it isn't undoable. And these can be solved with a simple FAQ. I definitely think you need to be careful of putting shuffle effects or enemy player milling into the set if you use the mechanic if your want to evoke progress. While Dreamscape actually embraces milling due to its design goal of making the game feel alien and fresh, thus milling can be a legitimate strategy which is very strange for most spikes and players card evaluation skills. Reuben: Can we rely on players to find these shortcuts, though? Haunt was similarly easy to 'shortcut' for, but players apparently often missed that. Could we potentially put that 'shortcut' into the mechanic itself? I wonder if we could say "put this card into your library face-up and sideways..."
Well I did say that my playtesters often found the shortcuts without prompting. Though to be fair thats a small sample size. Only like 9-10 players. I think the "sideways" test in the reminder text actually increases the comprehension Complexity as it brings something super minor and what can hopefully be made intuitive to the fore. The CC should be spent on them figuring out that the mechanic can be used with card draw etc. Other notes is that chaining multiple face-up cards is the best feeling ever. Also this mechanic plays far less intuitively online. Which is rare for a mechanic. But worth knowing if you decide to do testing of Tesla on cockatrice or something. That's why I added "and dexterity." At any given tournament with 100+ people I am likely to personally give multiple warnings for Looking at Extra Cards (almost always involving dexterity errors in drawing/scrying); the total number given at the tournament is undoubtedly higher. Scale it up to SCG/GP size and you're looking at a ton of penalties. I do not look forward to a situation where a stack of cards in the library is knocked over (perhaps exacerbated by some of the cards sticking out at odd angles) and the players start arguing over how many cards were on top of a given face-up card. Having face-up cards in the library also requires shuffling multiple unknown portions of the deck separately to perform a proper L@EC remedy. ETA: I'm a judge first, a player second, and an anything-else third. As such, I tend to look at any proposed custom design from the perspective of "how badly can a large group of players screw this up?" and "how loudly will they whine if I apply the fix that makes the most sense with the current IPG?" Maybe it's only 10% of a given room that consistently demonstrates sloppy/slow play, but those 10% are going to be a disproportionate amount of our judge calls. An interesting perspective. Mind if I ask you a few questions? How has morph been for the judging community recently? Its certainly something to be aware of but isn't the vast vast majority of mtg games played either casually or at FNM? Would you agree that like flavor, its best when a mechanic lines up perfectly with the ease of judging but gameplay trumps it? Should some of the more judge annoying mechanics never have been printed? Morph went through an IPG change, changing the automatic game loss to a warning (unless they actually played a non-morph face-down). When scaled up to GP levels, it was resulting in a lot of game losses and players trying to deliberately distract their opponents at the end of the game in hopes of getting a free game win. As far as I can tell the new morph rule seems to be received well. I can't speak to casual/FNM players, because I don't inhabit those spaces. I figure as long as enough cards in a given set are grokkable enough that a given group of casual players can come up with an interpretation that makes sense to them, it will not put them off from continuing to buy product of that set. By "gameplay", what are you referring to? Fun, skill testing, variety, etc.? I'm having a hard time thinking of any "judge headache" mechanics that tend to make gameplay more fun for both parties. I suppose morph, but once you get past the weirdness of special actions appearing at common, and get rid of the specter of Game Losses, it's not that bad. I do believe that certain mechanics should never have been printed. -Illusionary Mask. Camouflage. Anything that cares about graveyard order. -Phasing. The Batterskull interaction is cute, but it didn't really need to exist. -Tarmogoyf is annoying because of the damn dice SCG insists on using for coverage. If it was more fairly costed (2G for a */*) it likely wouldn't be an issue. -I hate the Miracle mechanic and combos that aren't a definite loop, but those are for reasons largely unrelated to judging. My first reaction to Battle-Charged was that it creates too much complexity; you'll need to look ahead to future turns and future sizes of creatures in order to make combat decisions in the present. However, I think this is appropriately lenticular and LSPs can easily ignore it, so maybe it's fine. Seeing this next to Renown from Magic Origins, I have to say that R&D found the cleaner take on this concept. But I still like this and think it has potential independently. I thought a very similar thing when I saw Renown - but I saw it as more of a take on Charger than Battle-Charged. I agree that Battle-Charged has the potential to be complex, but I don't think new players will see that complexity. It's the same gameplay as Festering Goblin in that sense - it can warp combat and future turns, but only for people who see that line of play. As you said, it's definitely lenticular. Congrats! I'm glad, your comments were always very insightful. I think Growing Progress is going to be important since it is a green concept. Tesla as a whole has always felt blue driven to me, and growing progress gives you an outlet for greenish mechanics. Uncertain one-time events are like trying to start a lawnmower. You just want the thing to do what its supposed to do, and when it works you aren't happy that your machine finally worked. You are frustrated that it took so long to do something it was built to do. I feel like this is one of the largest criticisms levied at Hearthstone. That you have cards with an obvious intention that don't always behave the way the player has in mind. That isn't to say that the mechanics can't be somewhat random, but this path sounds a lot like Miracles. I don't think uncertain-one-time is really the way to go. Certain one-time events bleed into the idea of progress, and making incremental progress toward an over all goal, a la suspend. This is a binary process since by its nature its a one-time thing. However, repeating certain events can lead to stagnant, predictable game play.Above I detailed that certain-one time mechanics are likely better than random one-time mechanics. The inverse is true here, uncertain repeating mechanics are better than repeating certain mechanics, by and large. Battle-Charge is great here since you are uncertain if your creature will survive combat to get your bonus. The Improvised Weapon Master in the post is an uncertain repeating mechanic. However, much like the lawnmower, when it doesn't do anything it doesn't do anything. Players are fine with some uncertainty as long as they get something. If, for instance, Weapon Master put a +1/+1 counter on itself when it failed then it would still fit into the overall scheme of progress and you would get a consolatory prize that wouldn't discourage you from trying again. I also feel that its important to have multiple types since they play off each other so well. It allows players to tend toward what they like more, certain-one-time bonuses, uncertain incremental progress, etc. Is progress necessarily a colored concept? I've been thinking of that myself - it certainly tends towards blue and green (since they are the colors of potential and growth), but can't every color improve and develop in its own way? I think this might warrant further exploration of how we can make 'colorful' progress. To be clear about uncertain anticipation of a one-time event: The idea is that the ANTICIPATION is uncertain, not the event itself. For an example, Student of Elements is uncertain one-time anticipation. The anticipation is uncertain because you can't guarantee you'll be able to grant it flying, and you don't know when you'll be able to. And it's a one-time event because flipping is a binary thing (as you said). The way I have it worded in the post, it sounds more like a one-time "chance", which I wasn't trying to imply. I'll fix that. Thank you. By the way, "You just want the thing to do what its supposed to do, and when it works you aren't happy that your machine finally worked." That's wonderful reasoning and a great explanation of the drawbacks of too much emotional investment. It's gotta be more likely to succeed than fail by a large margin, in order to be fun. "I also feel that its important to have multiple types since they play off each other so well." I think I agree with this, but at the same time, we probably want to focus on a specific type that plays best with our set. That's what I'm trying to figure out, starting this week - DOES one type play best with our set? And if so, which is it? In order to avoid Lee Owens' "lawnmower effect" we'd do well to take a lesson from Cascade. "How well can it go?" is a more fun question to ask than "Will it go wrong?". We may still want a clever way to address the feel-bad of shrinking the experiment pool by using it, but I haven't come up with anything that doesn't have memory issues or easy infinite combos. Getting a free spell is far better than reducing your potential for future spells by 1. Experiment is interesting. It'd be nice if you could play lands as well, gives you more 'successes'. I agree with Jay that the positives are so much more than the negatives in casting an experiment that it feels fine. Thinking about the idea of progression as a theme, I think the most likely source of inspiration is Theros. Theros had a progression. Heroic and Devotion were continual progression, Monstrosity was explosive progression. By necessity, these were permanent focused progression. 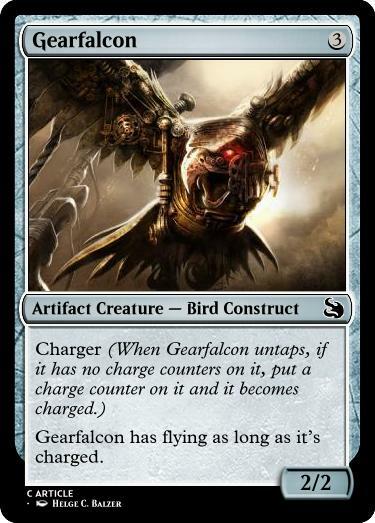 I think if you removed the cap from Battle-Charge than it would capture the feel of continual progression, and then in the creatures text box you could still have a, "If this creature has N +1/+1 counters on it, it gains trample, flying, etc," so that the player would still have that feeling of having Made It. Transform is probably the most explosive of the potential one-time event mechanics available. I think experiment is a good direction since its somewhere in between those two options. Its a bit wordy, but essentially the idea is you keep experimenting until you find the answer and then start on your next experiment. The play wording is to let you get land with the mechanic if you are short on mana to cast your other experiments. As worded it would go on instants and sorceries only, and I imagine be mostly a U/R thing. First off, I agree that Theros captured the theme of 'progression' quite well - one of the big things that started this whole discussion was me asking the question of how we are going to differentiate Tesla's sense of progress from Theros's sense of progress. "The "Hero's Journey" mechanics of Theros, similarly attempted to capture a feeling of "achievement" - but in a vastly different sense. In Theros, the achievements were unbounded - it was a continual sense of achievement, perpetual growth, the journey that has no destination. But in Tesla, we're giving players a VISION. We're pointing something out - "look at what you're capable of!" - and then we're handing them the reins, patting them on the back, and getting them to solve the puzzle of how to get from HERE to THERE. This journey has an end!" Also, the benefit of making this a keyword action is that a single card with Experiment has more chances of repeatedly Experimenting, which makes it less parasitic. As you have it, you have to run more Experiment cards in your deck to make it work. Unfortunately it's still really tricky to grok. The nice thing about the action keyword is that we can trigger it on permanents, or make a card that experiments multiple times. If testing shows we need to experiment a lot to enjoy the mechanic, that will be necessary. That said, template-not-withstanding, Lee's use of the experiment card itself is elegant and if the threshold to experimental fun is lower, could easily be the better option. I think we all agree this idea deserves to be tested. I don't think the division between anticipating the certain or the uncertain is as clear-cut as you make it. 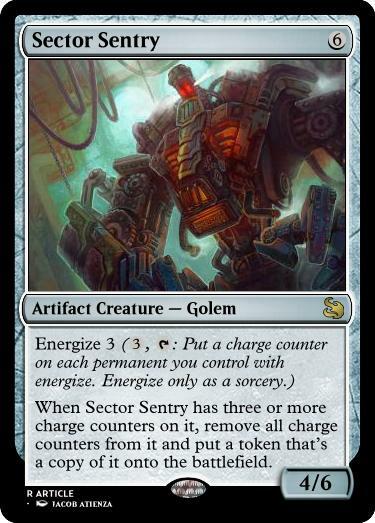 My go-to "anticipation" mechanic for Tesla is mecha: when I've got a Core on the table, I'm eagerly awaiting a Chassis. I don't know when the Chassis will come but I'm certainly hoping to draw one. But I know what will happen when I get one onto the table: my Core will turn into part of a cool huge thing that (say) deals damage every time it attacks. Or whatever. Similarly, with your Groundbreaking Discovery you know exactly what's going to happen (you'll draw 3 cards)... but will those 3 cards be any good? And for that matter will the board state in 8 turns' time leave those cards being at all relevant? Improvised Weaponmaster definitely manages to be way off on the "uncertain" side of the spectrum because it's got two kinds of uncertainty to it: you don't know whether Improvised Weaponmaster is going to get a bonus, or what kind of bonus it's going to get. Maybe rather than a spectrum it's just that there are two dimensions of certainty: when something is going to happen and what is going to happen. Improvised Weaponmaster is uncertain in both ways; ascendancy you know exactly what will happen but not quite when (you need to get enough mana). Mecha still manages to break that categorisation though, because although you don't know when you'll draw both halves, you have partial knowledge of what the result will be. Similarly, with Progress, I think of mechanics like March of Progress which doesn't seem to quite fit any of your definitions here. Does that mean it's not actually a kind of progress mechanic? I guess the March of Progress cards split into those which do something once with your MoP (the ETB trigger and the instant), which don't fit into the progress categories Inanimate outlines, and those which are continually updating (like the artifact creatures with static abilities), which have something of a feeling of growth to them. Mecha are certainly an interesting case, and while it doesn't solve that bit, I think your dimensional analysis is a good one. Of note, Magic tends to do a lot more of keeping trigger conditions consistent and changing the results than vice versa, so looking at mechanical themes, the the (un)certainty of when something will happen is likely a bigger factor. I'd argue that if we don't use March of Progress in high enough density for the non-permanents to feel like growth, it's not really a progress mechanic at all. The only way it has a sense of movement is when the last time you counted is pertinent enough to serve as a reference point. Regarding the division between certainty and uncertainty: AlexC, you are totally right. My definition of 'anticipating the certain' was knowing exactly when you could make something happen, and 'anticipating the uncertain' is not knowing exactly when that something would happen. I was thinking about it purely in terms of "waiting" and "hoping" - both of which revolve around time. However, your new system - which includes being uncertain/certain of WHAT will happen - is quite nice. Thank you for the excellent analysis and thoughtful critique! The reason I emphasized 'when' is exactly as Jules put it. If we're doing a mechanic, the 'what' is either going to be extremely constant, or variable depending on each card, and it doesn't actually factor into the anticipation as much - it's just the end result of that anticipation. Anticipation, to me, is all about the act of waiting/hoping, which is fundamentally about time. Regarding March of Progress: This is certainly an interesting case. The trick is to see it from the player's perspective, not the card. Individually, Jules is correct - its' not really a progress mechanic at all. But each time you play a March of Progress card, it gives you a bonus, and (sometimes) increases your MoP. And, eventually, you'll reach your maximum MoP in your deck. For this reason, I would classify it as "anticipating the uncertain" (drawing a higher MoP) and "growing progress" (since you get a reward multiple steps along the way towards maxing it out). However, my system was not designed to handle these kinds of mechanics, and AlexC has a point that this is an oversight of mine. This article was designed solely to look at the perspective of individual cards. My goal was to create a classification system for individual mechanics / designs that we could use to talk about - but MoP, as a broader mechanic or "archetype", is certainly a trickier case to talk about. In addition, I've already discussed how I don't think MoP feels sufficiently like progress (as it constantly pulls you towards the present battlefield, not the future), but I'm still uncertain of whether my thinking is actually true. I just know that, when I played devotion, I was never looking ahead as much as I was looking down to my board state - and I guessed that many other players felt the same way. The flavor and name are 'progress', but I'm not certain the experience and gameplay are. Thanks for the insightful critique and comments, AlexC! Anyway, I've wondered if there's ever been an attempt to get an official card to preview on GA from WotC? The blog receives significant traffic, but it's not an audience WotC feels a need to cater to. It's also hard to support a blog you're legally bound to half-pretend doesn't exist. Hmm. I wonder. Maro does write a Nuts and Bolts article each year specifically for those who like to create custom sets. Well, it can't hurt to ask. GA certainly aims at a very different segment of the playership. I like the Binary method of progress towards a goal more than making tick marks or watching something grow along the way. Maybe that's because the journey to the reward is less interesting to me as topdecking the combo piece I need. I get an immediate sense of accomplishment. This is probably why I also prefer the certainty of a one-time event (per card). I'm more in favor of Card 1 presenting a goal, and Card 2 delivering that goal. Delver of Secrets is a treasure trove of design hindsight, but that "reveal to flip for your reward" moments is one of my favorites. it's true that I might not ever reveal an Instant or Sorcery during a game, but since I built my deck to favor the flip, those times where it fails are not crushing disappointments. Not any more than failing to draw a removal spell, or source of White mana would be. I guess my second choice would be something growing as I head towards a goal. What would be cool is if the growing while moving to an end had less certain effects at each waypoint. Getting an effect with each marker, and that effect being something different each time. I'm still thinking of a mechanic that could represent this. Theshold (the mechanic) type effects are my least favorite expression of Progress. Downloading a file is a perfect example of for this too, because what do you do while downloading something? Nothing. You balance your checkbook, check your email. Anything to avoid having to sit an wait. That is not a feeling I want to emulate in a mechanic. Especially if the result isn't expected to be worth it, or it costs me development of my board state while I'm in the process. "Anything to avoid having to sit an wait. That is not a feeling I want to emulate in a mechanic." + "The journey to the reward is less interesting to me"
These are great points. The reason that we want a 'journey' - some amount of time you spend waiting, before you get the reward - is because it captures the story of technological progress, invention, and discovery. Tesla is a set about science, artifice, invention, and those things take time and trial and error - so it makes sense that we should incorporate that. In addition, we want our players to feel excited, to have something to look forward to - gotta build up some tension before we can release it as excitement with the payoff. Immediate gratification is fun too, but it's certainly different. When Delver of Secrets finally flips - or even better, flips unexpectedly on the first try! - it's a lot more exciting than if Delver of Secrets was guaranteed to flip. However! The fact we are deliberately making players wait and anticipate and hope is, indeed, associated with less-fun experiences than the actual payoff. You are correct - we have to be careful to make sure the waiting is balanced so that it's just enough to get players excited, but not bored and annoyed. "What would be cool is if the growing while moving to an end had less certain effects at each waypoint." Evolve is a great example of a natural way to do this. As the P/T rises, the number of cards with higher P/T in your deck naturally falls. It's a fantastically done mechanic. Trying to find other mechanics along the lines of Evolve sounds like a good idea. It would be cool if there were a way to use multiple hypotheses to narrow down a single card, or maybe add cards to the experiment and query them all. Alright, to be up-front: I am a dude who loves innovation and wackiness. Some of my favorite cards include Goblin Game, Obsidian Fireheart, Master of Predicaments - and some of my future sets are Future Sight, the Un-sets, and Conspiracy. So, yeah. This card is EXACTLY what I love most in Magic - something that we've never seen before, that does something thoroughly unique and interesting, and involves interesting mind-games. I think this is definitely some weird and quirky design space. If we're going for 'innovative', this is DEFINITELY that. But the bigger question: is it fun? I think this is way too swingy and close to gambling as is. With only one question, it's really often going to be a lucky guess. With more questions, it gets more skill-testing, but also more likely to succeed. The problem is the reward - playing a card for free is a BIG reward, and it's unevenly weighted towards higher CMC spells. My first idea was something to do with CMC, but... the balancing on that is too tough. Like, the lower the CMC, the more questions you get - but how do we determine that? I have no idea. Here's another, weirder idea. NOTE: I am NOT advocating we use this. I'm just sharing an odd idea I had for balancing. Yikes, that's super wordy. In this case, we're going with your first idea - you use multiple hypothesis to narrow down one card at a time. However, the new idea here is that you can 'push your luck' or 'be patient' - you have an incentive to verify you're as right as possible, since if you're wrong, you lose the chance to cast the card. This leads to some interesting strategies. Is it better to guess with each hypothesis blindly? Or to build up a bit more knowledge, THEN guess? Etc. I think this is getting somewhere a BIT better - since it helps solve the 'lucky guess' problem by disincentivizing that - but it's still not a perfect solution. One problem here is that it's very easy to manipulate the top card of your library. (Heck, Scry has just gone evergreen. )That doesn't matter too much with most mechanics that involve the top card of your library, but this one I fear is an exception because it's all about knowledge of that card's identity. I would suggest using the bottom card of your library, but unfortunately scry happens to also make that very easy to know about as well... There's always the Unexpected Results / Mind's Desire approach (shuffle then top card), but that's not good on a keyword mechanic. AlexC: Opponent takes a card from the middle of your deck? Jay: The reason I kept it as one-card-only in exile is so that it's easier to track which one you're asking questions about. I like the idea here, and find it fascinating. I'd like to give it a little playtesting. One problem is: in order for it to be reasonable to choose *not* to guess, there has to be quite some expectation of getting to make another guess before too long. Which means either a) this mechanic has to go on a whole lot of commons, which would have to be otherwise-vanilla creatures or very simple spells (Shock, Divination etc, but not Rampant Growth - too wordy). Or b) a single card has to let you do the hypothesis action more than once. Which I think can't be common. This is leading me to think that actually this might be better as a mechanic on just one card, an every-turn upkeep trigger on a legendary creature or an artifact. AlexC: The fact that this is leaning towards the increasingly-wordy and increasingly-weird makes me inclined to agree that this is probably more of a one-card gimmick than a mechanic. This reminds me of a mechanic I iterated on a while back, also called Hypothesis, that appeared on instants and sorceries. It read "Hypothesis (When you cast this spell guess land or nonland, then reveal the top card of your library. If you guessed correctly, copy this spell. You may choose new targets for the copy.)" It's a bit less wordy than the versions I'm seeing here, though it does remove the mind-game aspect.